TEAC A-R650 review | What Hi-Fi? It has been a while since we've seen a TEAC stereo amplifier and the A-R650, TEAC's new budget offering, is certainly strikingly designed, dividing opinion among our review team. If you like retro styling then this should be up your street, offering two large rotary controls for input selection and volume, plus three smaller knobs for balance, treble and bass. Along with the remote, these all feel good to the touch. 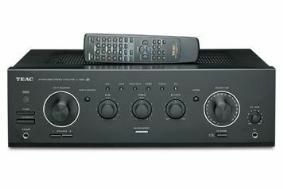 You'll find plenty of audio inputs but no phono stage. Partnered with our ATC SCM50 reference speakers, it fires out Radiohead's 15 Step from the album In Rainbows. Frantic, scattered drums see the TEAC struggling to gather it all together in to a composed whole, instead sounding disorganised and ruffled by the whole ordeal. We switch to the simpler structure of Eminem's Stay Wide Awake, which the TEAC finds more manageable, but the sound struggles to engage and entertain, and there's some hardness to treble notes. With price-matched speakers, such as EB Acoustics EB1s, the A-R650 sounds a little more comfortable but the delivery remains lacklustre. As proved in recent tests, the budget amplifier category is staggeringly strong at the moment, a fact which sadly leaves this TEAC amp scrabbling for scraps below the best.